Given his considerable success it's hard to disagree with Paul McCartney's claims that his lack of formal musical training has never held him back. He believes his natural musical abilities are a heaven sent gift, one that he might have lost had he had ventured down the formal route of learning to read music. His reluctance to learn music began when he was living in Speke. It all happened when I was a kid going to piano lessons with the old lady down the road. I did the usual five-finger exercises. I thought "Oh my God, this isn't what I think music is". It seemed like homework to me, so I stopped. By 1958, Paul was a member of The Quarry Men. His Dad Jim tried for a second time to make him learn the piano properly. For Jim, being able to play the piano was a passport to popularity, leading to plenty of party invites. For Paul, already composing his own songs, learning the piano would enable him to write on an instrument other than the guitar and broaden his musical knowledge. He was keen but after his previous experience he had hoped that Jim would show him on a less structured, more informal basis. Jim was self taught and fearing Paul would pick up his bad habits he declined, insisting he be tutored properly. I would say 'Teach us a bit,' and he would reply, 'If you want to learn, you've got to learn properly'. It was that old ethic that to learn, you should get a teacher. Jim found the money for lessons for both Paul and Mike, and remembering Paul's previous experience with the stuffy 'old lady' thoughtfully picked a young man to teach them. 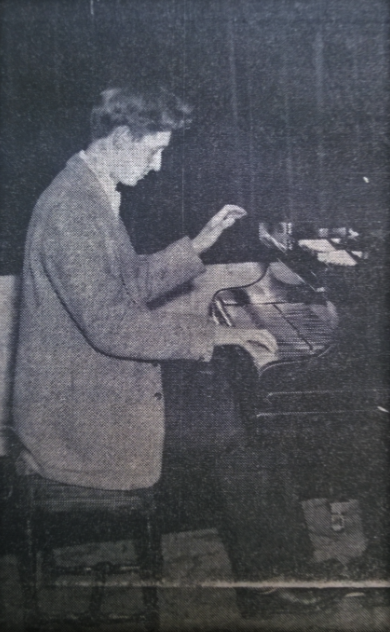 The young man was Leonard Milne, a 21 year-old piano graduate and tutor. 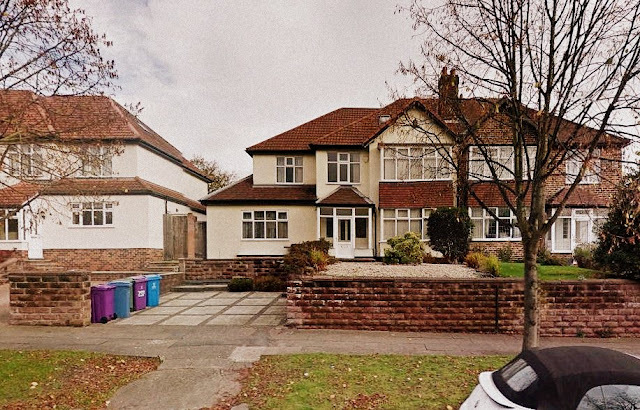 It's not entirely clear how many lessons Paul had but for a time he had weekly tuition at Milne's house, facing the Police Station on Mather Avenue which the McCartney's own home backed on to. Of course, Paul being Paul, the lessons quickly came to an end, much to Leonard's disappointment, but probably not surprise. Paul had put up with this attempt at tuition for about as long as the previous one in Speke. Leonard clearly had some skill, but how had he come to the attention of Jim McCartney? Although only 19-years old, Mr Leonard Milne, organist at Speke Parish Church, is determined to fulfil two ambitions this year. They are to make All Saints Church, Speke, the musical centre of the entire estate and to raise the best part of a thousand pounds towards funds for an organ at the church. some of his fellow students. On Sunday last week, Leonard arranged a carol concert in the church, the first programme of its kind to be held there. It was a preview of the concerts which will be presented during the coming year. Leonard played the organ and was also the conductor! For a time circa 1952-53, Paul was a member of the 16th Allerton Group St. Aidan's scout troop attached to All Saints Church in Speke. 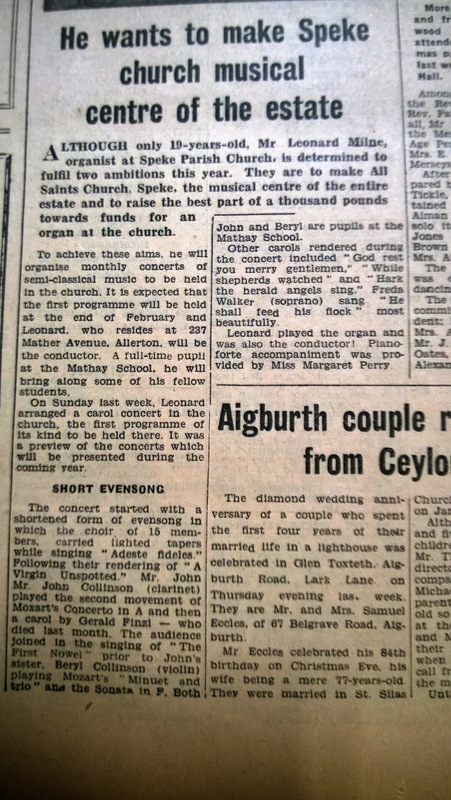 Membership of the scouts usually entails some form of attendance at the church so perhaps Milne was previously known to the McCartneys - or Jim at least - from their time there. Mr Leonard Milne ... 1970 to 1973 when I was at WKGS we used to call him "curly wee" (not to his face though!) ... I can still see him bouncing up and down on that chair and counting off the eight beats of that last long note. We always used to sing the school song on the school's birthday, and practice it in music lessons just before the event, and Mr Milne used to conduct the last line by chanting, "Rings the farewell call, Well - Done - two - three - four - five - six - seven - eight - OFF". Naturally, when it came to actually singing it at assembly (with the full Board of Governers present) a number of us would sing the last chant "curly wee style" instead of singing the proper words, and then get to miss first lesson because the whole school would be kept behind in assembly "until the guilty ones stand up" which, of course, we never did. He was clearly well thought of. When Mark Lewisohn traced him in 2010 and interviewed him for Tune In he was suffering from dementia, and his daughter later phoned to thank him for asking him about things he could remember with clarity. It have given him and his family quite a lift. Mr Milne passed away in 2016. ** Quote compiled by Mark Lewisohn from interviews with Paul by Edward Seckerson (Kaleidoscope, BBC Radio 4, 4 October 1997), Ed Stewart (BBC Radio 2, 14 December 1991) and Melvyn Bragg (The South Bank Show, LWT 14 January 1978). *** The Tobias Matthay School of Music was situated 'next door' to the Walker Art Gallery. The wonderful article about Leonard Milne was discovered in the Liverpool Records Archive (LRO) by Peter Hodgson. A great and unexpected find Peter! Touching. So nice to learn more about these boys. But I'm sad to know Mr Milne suffered from dementia. Beautiful house!